So many ways to make a perfect and easy Chipotle Guacamole Recipe. Some require more time and effort, but I’ve always been a fan of easy and delicious. 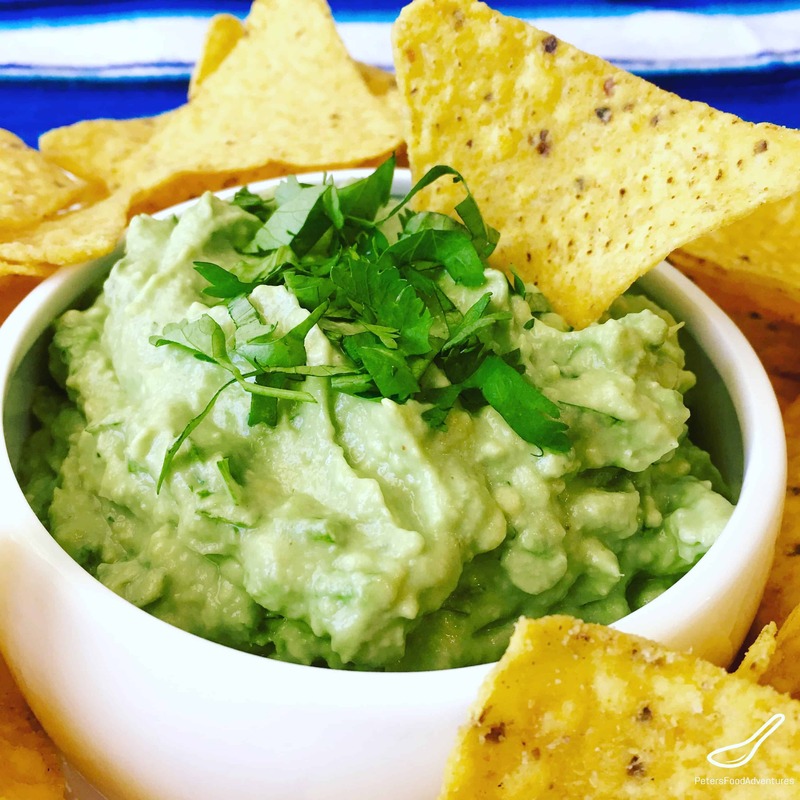 Guacamole is a natural accompaniment to dip with your nacho chips and salsa. Guacamole, sometimes referred to as ‘guac’ originate with the Aztecs. It has evolved to be an integral part of modern Mexican cuisine. It’s basically mashed avocado with salt, with some recipes adding fresh tomatoes, onion, chili, chipotle, cilantro, jalapeños, sour cream… the list goes on. Sour cream isn’t usually added to Guacamole, however, I find that even just a little bit adds a creaminess and makes the Guacamole easier to mash with your fork. This is the secret to a creamy guacamole. Don’t overuse sour cream, it’s not the hero of the dish, the avocado is. It will bland out and overpower the avocado. It’s important to use ripe avocados, as the green hard avocados will taste awful and will be hard to mash. 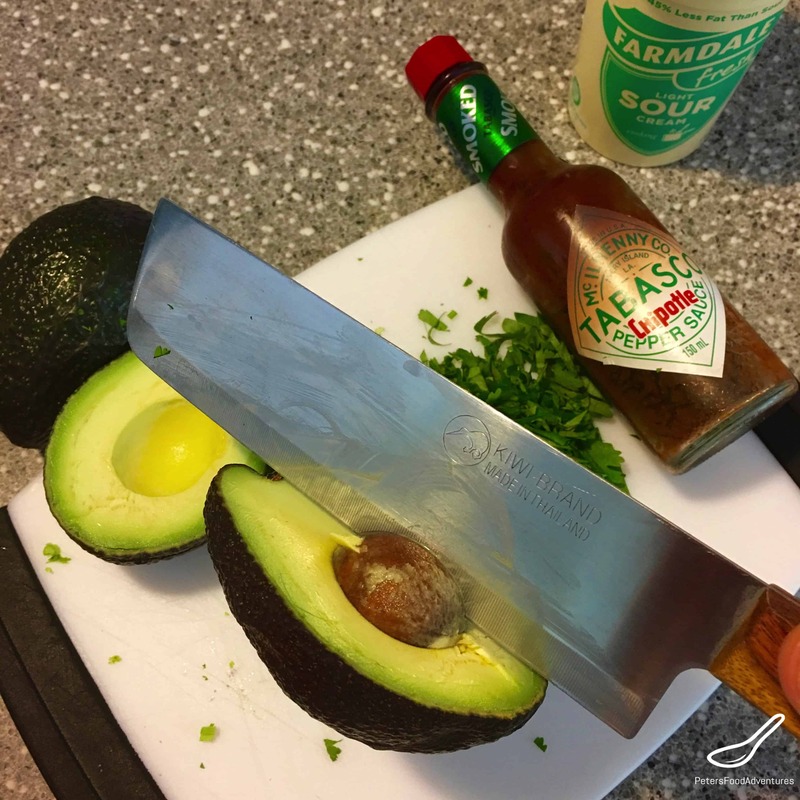 To remove the avocado seed, very carefully, whack your knife to the centre of the seed (of a half cut avocado) until it grips in, then twist to remove the seed. Be careful not to cut yourself! This way the avocado seed removes cleanly and you won’t waste any delicious avocado. What’s a Good Substitute for Chipotle? I love the smokey flavour of Mexican chipotle peppers, but sometimes they’re hard to find. They add an amazing flavor. 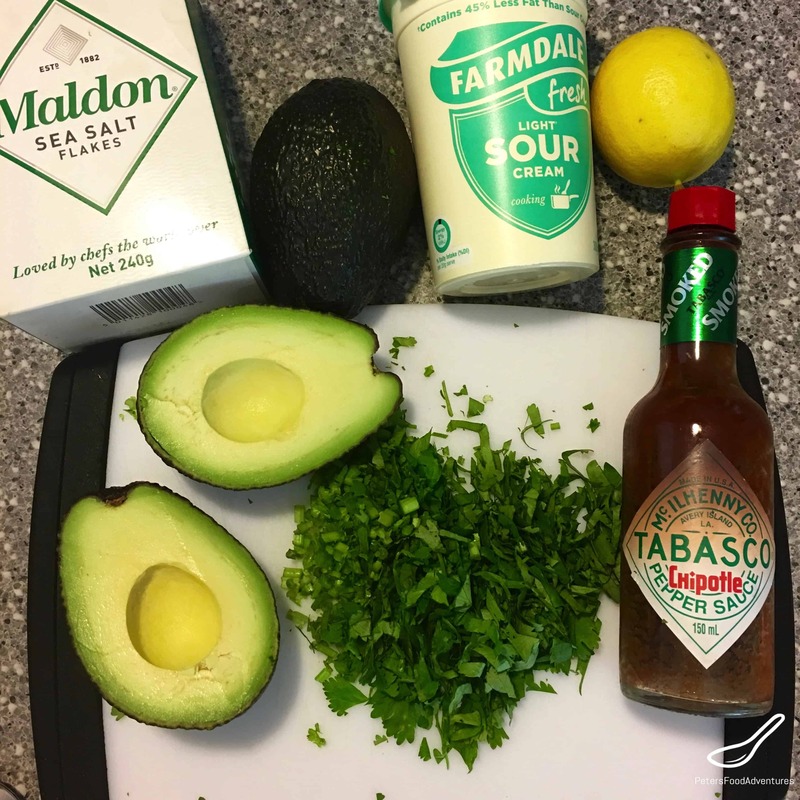 Tabasco brand chili sauce makes a Tabasco Chipotle sauce, which is a perfect easy addition to guacamole. Add a few dashes. I use about a teaspoon because I like it spicier. It takes care of the chili spiciness needed for this recipe. It adds a great ‘Mexican’ authentic smokey flavour to your guacamole. Guacamole is very healthy due to the vitamins and the good type of saturated fat. I love the zing that garlic adds, which sometimes I can get carried away with, but hey, I’m Russian and we all love garlic! I don’t like adding tomato and onion to my Chipotle Guacamole recipe, as those ingredients are found in Salsa, usually eaten right beside my guacamole. 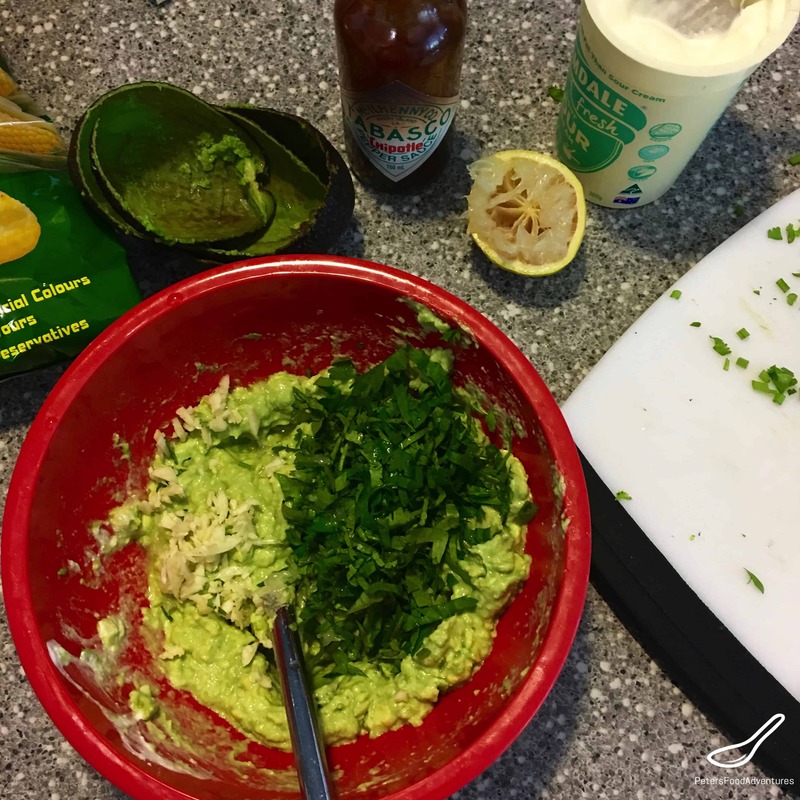 This Chipotle Guacamole Recipe probably doesn’t even take 5 minutes to make, and is so good, I could eat it all day long. Bon Appetit! Приятного аппетита! In a bowl, mash the avocado with a fork until smooth. Add the sour cream to assist the mashing. Add the minced garlic, salt, lime juice cilantro and mix together. Start with ½ teaspoon of Tabasco Chipotle Sauce, mix, taste, and repeat if necessary for more Chipotle flavour. Season with salt and pepper to taste. Serve with corn chips or add to your favourite Mexican meal. Thanks Lynne! Yes simple! The secret is the chipotle Tabasco! ???? Fresh guac is the best!! I’ve never tried it with sour cream/tobasco – I’ll be sure to make this next time! Thanks for checking it out Jasmine! It just needs a little bit of sour cream, so good! Thanks Ellie! I think so too, and easy to make!